Using the module requires a configured and working mail server, for example Postfix. * entry to the log with the details of the activity. String fromAddress - sender address. String toAddress - recipient address. String subject - mail subject. String message - messages which is treated as html. Second service provides API for browsing logged email activity and deleting unwanted logs. Send Email - gives you the ability to send e-mail messages. 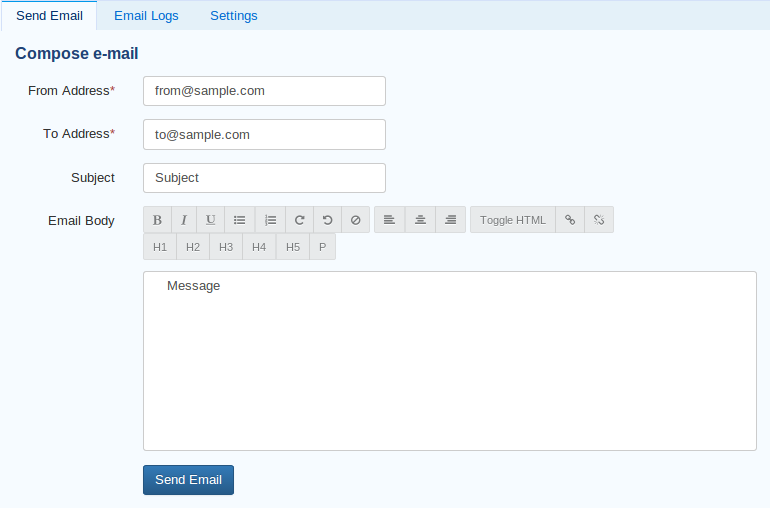 Email Logs - allows you to view and filter email logs, you can also export them to a csv file. Settings - allows you to change the current configuration of the module. Email Junior Admin - user can send mails, change module settings and view basic email logs(user can only see message status and delivery time). Email Admin - user can send mails, change module settings and view detailed email logs. The Email module registers an event handler to allow other modules to request sending emails. This event is exposed to the Task module as a task action, so you can send mails using the Task module.